This Fitzroy close coupled bathroom suite is the ideal upgrade for any traditional bathroom. It's Victorian and Edwardian inspired design will add a touch of elegance and style. 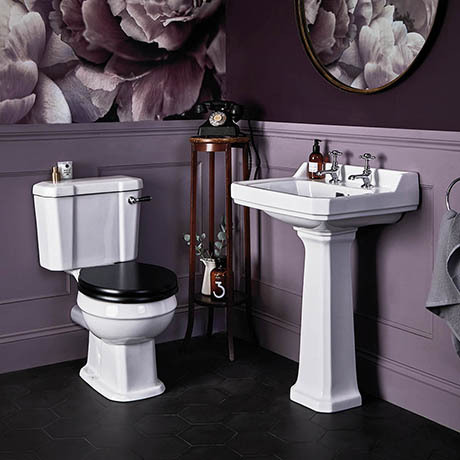 The suite comprises of a close coupled toilet with a ceramic lever flush and a full pedestal 2 tap hole washbasin available in three sizes. Bayswater offer a 5 year guarantee against all of their ceramics. Please note: Toilet seat, taps and waste not included.